Four years ago today (November 23rd), Blizzard threw open the doors to Azeroth and then quickly shut them, opening and closing them several times until they were sure they had enough servers to handle the massive rush of players eager to enter the World of Warcraft. 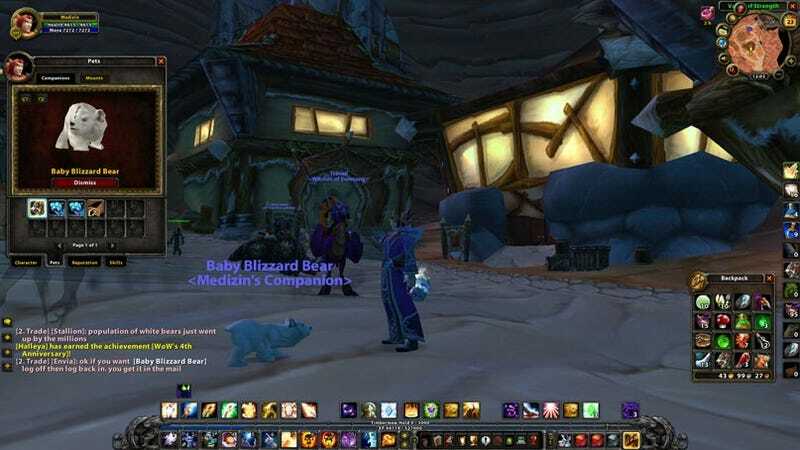 To celebrate 1,460 days of lost time, broken relationships, and weight gain (and I'm not excluding myself here), folks who log into the game today are gifted with the achievement "WoW's 4th Anniversary" and an adorable little baby polar bear to follow them around everywhere they go. For those of you online right now, you actually have to log off, then login again to receive the award. Consult your instruction manual for directions on how to actually log off.